In Trust Agents, two social media veterans show you how to tap into the power of social networks to build your brand’s influence, reputation, and, of course, profits. Today’s online influencers are web natives who trade in trust, reputation, and relationships, using social media to accrue the influence that builds up or brings down businesses online. The book shows how people use online social tools to build networks of influence and how you can use those networks to positively impact your business. Because trust is key to building online reputations, those who traffic in it are “trust agents,” the key people your business needs on its side. If you want your business to succeed, don’t sit on the sidelines. Instead, use the Web to build trust with your consumers using Trust Agents. 1. Chris Brogan and Julien Smith present a wonderful framework or blueprint for behaving, acting, and interacting on social networks. Although I wanted them to discuss more of the tools/technologies they use on a daily, weekly, and monthly basis to manage their social media networks they purposely left this information out. The purpose of the book is to help you leverage social media channels for your brand and they offer more theory than discussion of tools. The tools can change but the ideas offered in the book remain timeless. 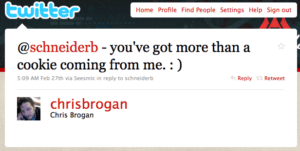 The idea behind Web 2.0 and social media is engagement and not which tool you use today to tweet. 2. As I read the book I couldn’t help notice the undercurrent of advice with regard to “how” to act and “why” you should act that way in your work with branding and social media. The book serves as a text book for social media etiquette which can be especially helpful as you begin your journey with social media. I guarantee that you will find this book invaluable as you begin listening to social media channels and will be something that you will consult again and again in your work. Pretty cool if you ask me! Did I also mention that I have never met or communicated with Chris prior to these tweets. 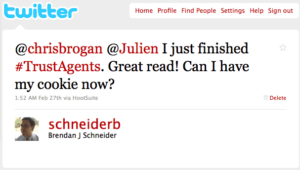 I found these tweets a wonderful, real-world example of the power of social media: making connections and engaging, as well as an author following his own advice. Keep up the great work Chris and Julien and I have begun my journey toward 00 status. I would love to hear from other people who have read the book and have examples of social media at work. It would also be great to hear from any Trust Agents out there. By the way, Chris and Julien, do you drink Martini’s? Thanks for taking the time to comment Chris. It means alot! I’m actually reading Social Media 101 right now and plan to review that book soon. I actually think it does read well but serves a more directed, specific purpose. Thanks again! Seems like it’d be lame if we wrote about that and then didn’t follow through. We don’t use any tricks to find it, except for scanning Twitter for the words “trust agents.” So, some times, it’ll be a bit late, because you know… it’s not like Twitter is our life. : ) But I’m glad I was there to catch it. Brendan – great review. I agree – Chris really walks the walk, which is no small feat given the demands on his time. I read Trust Agents cover to cover this summer, along with Tribes and the Whuffie Factor. I imagine SM 101 will be a great refresher for the basics in Brogan's language, which I love. His delivery hooks me every time! 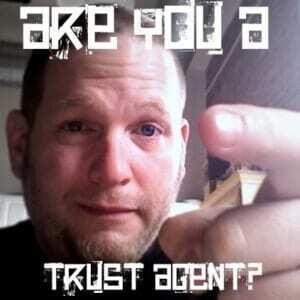 I read Trust Agents cover to cover this summer, along with Tribes and the Whuffie Factor. I imagine SM 101 will be a great refresher for the basics in Brogan’s language, which I love. His delivery hooks me every time! I too am excited for the new book. Have you started it yet? What are you initial thoughts?